Easier switch between creation modes: Quickly switch between the drawing and selection modes - hold down Ctrl/CMD to switch to the select mode, and release to switch back to drawing mode. Jamboard is a great tool for brainstorming, encouraging collaboration, and generally bringing ideas to life. This launch makes it easier for everyone on your team to collaborate on jams, regardless of whether they’re by a physical Jamboard or not. With these improvements to Jamboard on the web, and the pre-existing apps for phones and tablets, we hope more if your team can join in and share ideas, capture sticky notes, brainstorm, and much more. End users: Go to https://jamboard.google.com to get started, or use our Help Center for more details on how to use Jamboard on the web. Rapid Release domains: Keyboard shortcuts, frame management, and mode switching will have a gradual rollout (up to 15 days for feature visibility) starting on Jan 23, 2019. Scheduled Release domains: Keyboard shortcuts, frame management, and mode switching will have a gradual rollout (up to 15 days for feature visibility) starting on Jan 23, 2019. 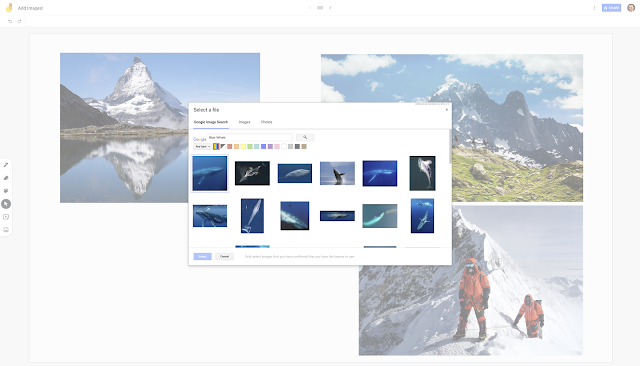 Better image management will start rolling out in February. Keep an eye on the G Suite Updates blog to know when to expect it. Available to G Suite Basic, Business, Enterprise, Enterprise for Education, and Education editions. Not available to G Suite for Nonprofits edition.